Q. What is the Wombat Keeper all about? A. No one quite knows, especially its editor. Some say it is a Waste Of Money Brains And Time. Q. Is it not about Wombats then? A. 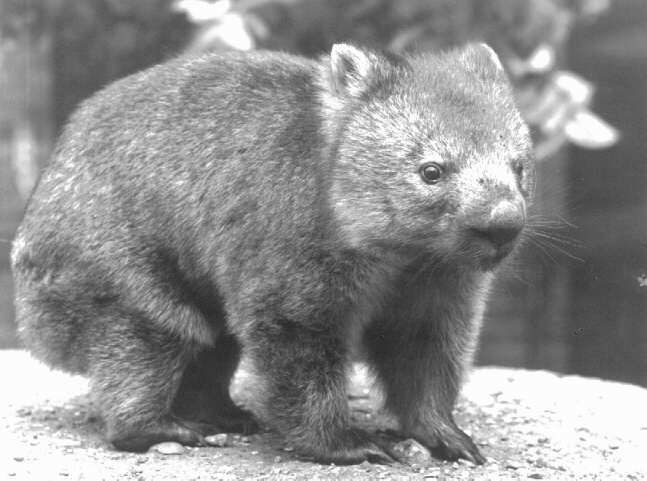 The WK is the magazine devoted to the psychological effects wrought on the 433 heroic souls in Britain who keep wombats. Q. Are wombats difficult to keep? A. For sure. They burrow through your lounge furniture, they tear up the carpets, mate with the lawn mower, squish all their food, burp in your face, grow to be as big as your freezer and scare your friends by baring their big yellow pointy teeth. Q. I didn't think it was legal to keep wombats in Britain! A. Heck - it couldn't have been legal to export them from Australia now the bounders are breeding like Cane Toads over here. A. Sure thing - no one in their right mind would keep a wombat! London Zoo tried but poor Edna (she was gorgeous) died many years ago and they haven't bothered to replaced her. Q. I'm not sure about all this. Can I download the Wombat Keeper Magazine from here? A. Yes - try the WK Archives.